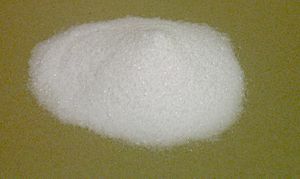 Sodium bicarbonate is baking soda, bicarb or bicarbonate of soda. It is a chemical compound, sodium hydrogen carbonate, with the formula NaHCO3. The elements within it are sodium, hydrogen, carbon, oxygen. It is a white crystalline powder. It is an antacid: it was in the past to relieve acid indigestion a sickness caused by lots of acid in one's stomach. This was usually done by mixing sodium bicarbonate with water and drinking it. When there is too much acid, it causes heartburn, an uncomfortable feeling in the stomach. It reacts with acids to produce carbon dioxide gas. It also reacts with bases to reduce their harmful effects. When sodium bicarbonate is heated, it releases carbon dioxide and water vapor (gas) and turns into sodium carbonate. Baking soda is rarely found in the earth. It can be manufactured artificially, though. Sodium bicarbonate Facts for Kids. Kiddle Encyclopedia.